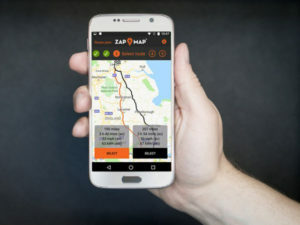 Zap-Map has released a new smart Route Planner to help remove range anxiety for EV drivers planning longer electric journeys. Currently available on the Android app with an iOS version due this summer, the new functionality draws upon the UK-wide charge point data in the current Zap-Map app, enabling drivers to generate a ‘quick plan’ that will suggest up to three suitable rapid chargers within one mile of their route which are closest to their estimated ‘drive range’ for each journey leg. Drivers can also customise their route by adjusting charger search criteria, percentage battery charge assumptions and route filters. Calculations are based on estimates of real range and energy efficiency for particular EV models and users are able to over-ride real range values depending on their own driving experience. The plans also take into account routes with an average speed over 50 mph or with significant inclines based on real-world data. A future version will include additional range factors and notifications to alert drivers en-route in the event of road closures or planned charge stops going offline.